Today marks the half way point through this journey. I can’t believe how much I’ve learned, my brain is full! Today was a pretty good day! I really enjoyed both of these paintings. 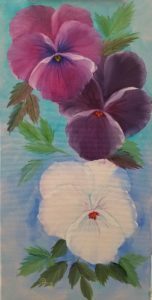 I think pansies might be my favorite flower to paint thus far.